Tagged 2014 Sasuke ASEAN Open Cup, Ninja Warrior, Sasuke Malaysia, Zainariah Johari. REMEMBER Naruto? That anime which featured the trials and tribulations of a bunch of young ninjas? Well, that may have been based on fantasy, but that sort of action can be had for real here now, too, courtesy of Sasuke Malaysia. Founder and executive director of Sasuke Malaysia, Zainariah Johari, explains that Sasuke is basically an obstacle course that challenges the physical and mental aspects of its participants. The course could easily look daunting for first-timers, but Zainariah stressed that everything is set up in accordance to the high safety standards established by Japan, the source of the sport. Zainariah was struck by an epiphany in 2011 after watching the original Japanese Sasuke series, which inspired her to introduce the competition here, hoping it would cater to people from all walks of life. According to her, the younger generation is looking for alternative outdoor activities these days. Now, the 50-year-old can proudly say that Sasuke Malaysia isn’t just open to locals, but also to international participants as seen at the 2014 Sasuke ASEAN Open Cup in Petaling Jaya, Selangor recently. “I think it’s great that we get to meet competitors from other countries – they are really fit and have trained a lot for this,” said Malaysian participant Mohd Redha, 25, who intimated that we could do a lot by learning from foreign atheletes. Malaysia was ranked third in the competition, a great achievement for the country, considering that this was the first competition for local participants. Members of the team that represented Malaysia at the 2014 Sasuke ASEAN Open Cup: (from left) Mohammad Sufian, Muhammad Zaki, Mohd Redha, Khairul Hafiz and Amirul Ashraf. “What we’re aiming for is to have this kind of tournaments throughout Malaysia, so there’s greater awareness for the sport,” said Sasuke Malaysia’s technical director, Alex Chia. Chia also expressed his wish to organise next year’s Sasuke ASEAN Open Cup and to push for Sasuke’s inclusion in the SEA Games. For the recent Sasuke ASEAN Open Cup, Sasuke Malaysia collaborated with the Ministry of Youth and Sports, sparking hope that Sasuke could eventually become a recognised sport in the country. Chia recalled that in 2012, a representative from the Ministry of Youth and Sports followed them to Japan for a meeting with the Tokyo Broadcasting System, hoping to learn how to package the TV series into a sport for Malaysia. This eventually led to the 2014 Sasuke ASEAN Open Cup. “Once we become an official sports association, we can then start to register people as members,” said Chia. That news was greeted with delight by participants of the recent competition. “I’m hoping for more competitions and perhaps, better prizes?” said 27-year-old contestant Khairul Hafiz with a laugh. Chia is convinced that Sasuke is a sport in which anyone can join. “Anybody can be a champion, but to be good at it, training is essential,” he asserted. The equipment for training is readily available because Sasuke only requires simple techniques and physical activities for its training. “Most parks in Malaysia have suitable equipment. Monkey bars can be used to train your upper body,” added Chia. The Devil Steps is a physically demanding obstacle that requires lots of upper body strength. With the collaboration of the Ministry of Youth and Sports, Sasuke Malaysia hopes to organise training sessions once it becomes a full-fledged sports association. But Sasuke is not only about having the right tools – like any other sport, preparation is key. Muhammad Zaki, 21, a participant from the 2014 Sasuke ASEAN Open Cup adds that mental determination plays a big role in the sport. “During the competition, I was quite excited and happy, but at the same time, it was scary for me. I think there were all sorts of emotions running through me at that moment. “Fear will always be there, but if you don’t try, you will never know how well you can perform. So, don’t be afraid of failing and just give it a go,” he advised. 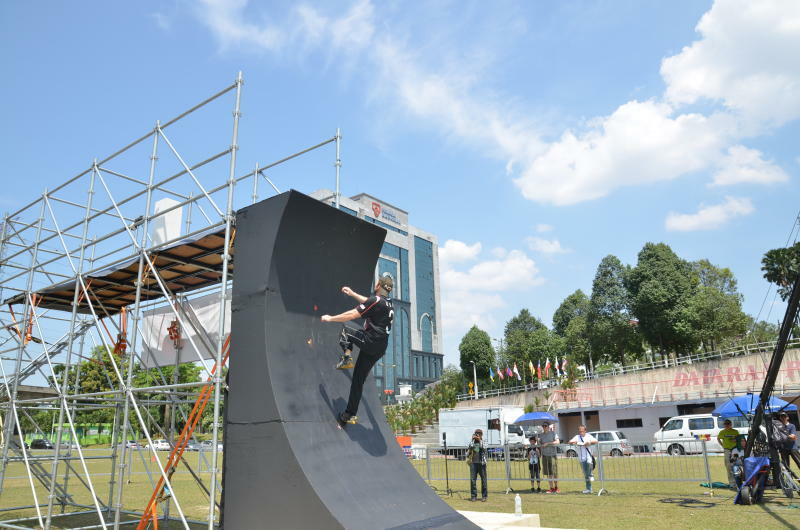 Zainariah says that Sasuke Malaysia would be organising more events in the future, including a tour of the country while next month, it will organise an extreme sports event at Universiti Kebangsaan Malaysia (UKM) in Selangor. Up against it: The Warp Wall has proven to be a mammoth challenge as participants have to scale a curved wall in three or less attempts. Zainariah said that they have been getting more heartfelt support from international competitors, too, and hopes more young people will join the upcoming events. “This is a great way to promote your country,” she concluded. Despite having Sasuke in its name, Sasuke Malaysia is not related to the character from the Naruto animated series. Instead, it originated from a television variety show of the same name in Japan, which has been running for the past 17 years. Here’s what Sasuke is all about. The original three-hour television series started in Japan back in September 1997 and was aired on the Tokyo Broadcasting System. This year, the Japanese sports entertainment television series will be entering its 30th season, making it one of the most successful of its kind. As it stands today, Sasuke has reached 150 countries, including Australia, Russia and Singapore. In Malaysia and the United States, it was rebranded Ninja Warrior. Simply said, Sasuke is a four-stage obstacle course that pits 100 competitors against each other. The obstacles get progressively more challenging through the length of the course. After registration, applicants are subjected to various interviews and physical tests until they are trimmed down to 100 competitors. Prior to the 18th season, participants had to complete a 1.2km dash, which would determine their starting positions in the actual event. At the recent 2014 Sasuke ASEAN Open Cup, various obstacles were set up to test the three main physical disciplines of the participants – jump, power and hang. The obstacles that were put in place even had catchy names, such as Warp Wall, Devil Steps and Cliff Hanger.